GW LAW SCHOOL BECOMES THE FIRST TO JOIN THE AMERICAN BAR ASSOCIATION -ENIVRONMENTAL PROTECTION AGENCY "LAW OFFICE CLIMATE CHALLENGE"
WASHINGTON - This month, The George Washington University Law School became the first law school to participate in the Law Office Climate Challenge, an initiative created by the American Bar Association (ABA) and U.S. Environmental Protection Agency (EPA) to promote environmental sustainability. The Climate Challenge was created in 2007 by the American Bar Association Section of Environment, Energy, and Resources, in cooperation with the U.S. Environmental Protection Agency, and is designed to encourage law offices to take specific steps to conserve energy and resources, as well as reduce emissions of greenhouse gases - which cause global climate change - and other pollutants. Among the other 74 members of the challenge are private firms such as Arnold & Porter, Beveridge & Diamond, and Weil, Gotschal and Manges. "GW Law has been dedicated to the field of environmental law for nearly 40 years, and we are delighted to play a major role in our university's sustainability initiatives," said Frederick M. Lawrence, dean of GW's Law School. "This is not just something we study and teach, but something we practice and in which we lead by example. I am immensely proud of this recognition of our commitment to the environment." GW's Law School is meeting the challenge by participating in the "Best Practices for Office Paper Management" program. It now uses 30 percent recycled content paper for copying and printing, has requested its staff to use double-sided copying in most instances, and has provided recycling receptacles for all offices with the goal of recycling 90 percent of mixed office paper. Because the life cycle of one ton of paper results in the release of 11 tons CO2 to the atmosphere, conserving and recycling paper can help in the effort to deal with climate change. LeRoy Paddock, associate dean for environmental studies, said, "Law schools, like law firms, use a tremendous amount of paper. It is important in an increasingly resource-constrained world that we all be thoughtful about how we can carry out our mission while conserving resources and, at the same time, help our students understand that they can take practical steps throughout their work life to contribute to a more sustainable future." Member organizations also can participate in the ABA-EPA Law Office Climate Challenge by purchasing renewable energy either directly or either through renewable energy credits as part of EPA's Green Power Partnership Program or by reducing energy use 10 percent under the EPA's Energy Star Program. This is the latest initiative by The George Washington University to promote sustainability. In October 2007, GW President Steven Knapp created the Presidential Task Force on Sustainability, which charged a group of students, faculty, and staff with developing recommendations to enhance GW's academic initiatives in the areas of environmental stewardship and climate change, as well as examining and suggesting improvements in relevant university policies. The task force submitted its report in June 2008, a digital copy can be found at: http://www.sustainability.gwu.edu/. Established at the beginning of the modern environmental law era, GW's Environmental Law Program has been at the forefront of education in the field for more than 35 years. Today, the program is expanding significantly to provide the next generation of environmental lawyers with the tools they need to tackle the local, national, and international challenges facing the planet and its inhabitants, including climate change, fisheries depletion, air pollution, water scarcity, and developing new sources of energy. GW Law was established in 1865 and is the oldest law school in the District of Columbia. Accredited by the American Bar Association and a charter member of the Association of American Law Schools, the Law School enrolls approximately 1,950 students each year and was ranked 20th in the nation in the most recent "America's Best Graduate Schools" edition of U.S. News & World Report. More information on the ABA-EPA Law Office Climate Challenge is available at http://www.abanet.org/environ/climatechallenge/overview.shtml. 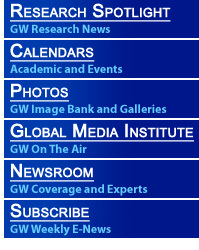 For more information about GW Law, visit www.law.gwu.edu.